Hvac Service Tools necessary for the Air Conditioning Serviceman. The hvac service tools necessary for the air conditioning serviceman are many. Many of the necessary tools are also dedicated for use in the hvac trade only. The air conditioning serviceman will also need to be EPA certified to be legal to work on systems containing freon (refrigerant). If you are not EPA certified, it is not a good idea to attempt to work on a freon based air conditioner. Release of refrigerant to the atmosphere is, not only harmful to our atmosphere, but you can be heavily fined for touching the system without the proper credentials. Your neighbors can get a nice reward for turning you in! The first of the hvac service tools you will need is a set of refrigeration gauges for testing pressures and refrigerant charging. The gauge set will have a manifold, 2 gauges and 3 different colored hoses. Your first set of gauges should be listed for use with R-22 and R-410A. Next on your list of hvac service tools should be a recovery machine. This is an absolute necessity. This unit will purge the existing air conditioner and refrigeration lines and move the freon into the recovery tank for temporary storage or for sending off to the recycler. If you are replacing an outdoor condenser, the refrigerant is the same, and there has not been a compressor blow-out, the old refrigerant may be used to top off the charge in the new unit. Invest in good copper tubing cutters. You will need a few different sizes, including a very short hand unit for tight spaces. Next is the torch set. Invest in a good oxygen/acetylene torch set. In the days of old, refrigerant pressures were lower, and refrigeration lines could be soft soldered. Those days are rapidly disappearing. Most replacement residential air conditioners nowadays utilize R-410A refrigerant, which is higher pressure. Refrigeration lines must be brazed. Your torch set should be kept stocked with brazing rod, sandpaper for prepping joints, rags, and an adjustable extension mirror. Once your system is brazed together everywhere, you will need a nitrogen bottle with nitrogen gauges to check for leaks. Next is the vacuum pump. 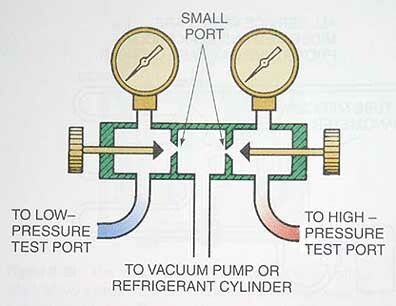 Once you are confident the system is leak free, the vacuum pump hooks into your refrigeration gauges. This unit will pull the entire refrigerant system down into a vacuum and remove any non-condensibles (water/moisture is a non condensible). When it comes time to do the AC start-up or service a unit, you will need a good volt/amp meter, service port wrenches, leak detector, and a dedicated hvac temperature probe.